By now, I’m sure you know of my love for all things Disney! Disney’s Monster’s University came out on DVD + Blu-ray this past week, so we kicked back this weekend and had a fun movie night with the kids and watched it. 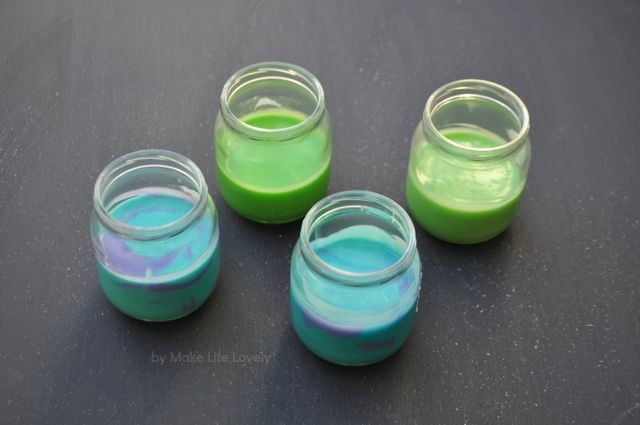 I also made some fun treats for our Disney movie night… colorful mini cakes that match Mike and Sully’s colors that I baked inside baby food jars! I just love this technique, and will share with you exactly how you can make your own! 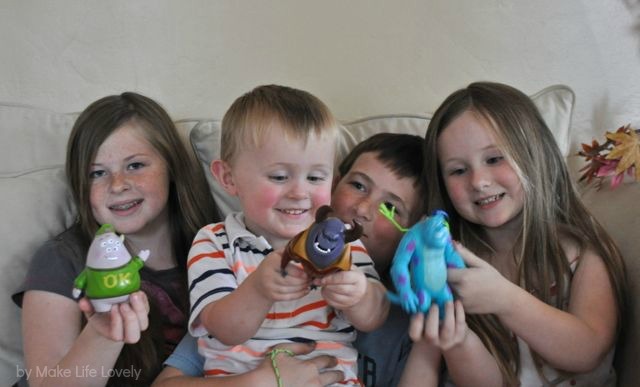 We love surprising our kids with Disney toys, so when we bought the special Monsters University 2-Disc Blu-ray + DVD + Infinity Figure Combo Pack at Walmart, we also picked up a few Monsters U toys for the kids to add to their collections. They already had the Sully and Mike toys, so we bought them Johnny and Squishy toys, too. 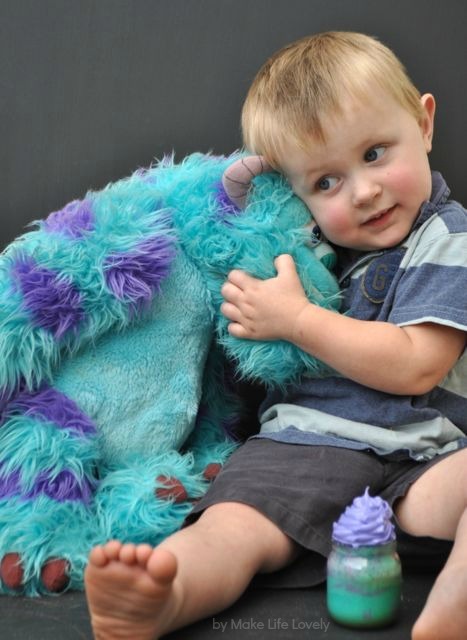 The kids loved that the Squishy toy was actually squishy and squeezable, just like the character! 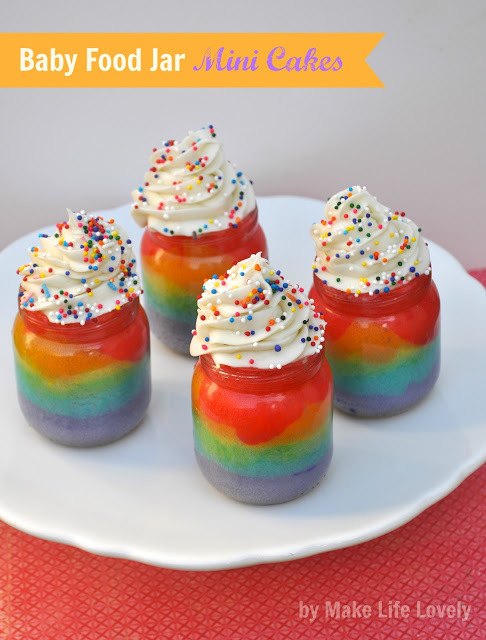 You might remember these mini cakes from when I shared with you my Rainbow Cake in a Jar baked in a baby food jar. My Monsters University cupcakes are very similar, just without all of the layers of color, and with bright colors of frosting! 1. Make sure the baby food jars are clean and have the paper removed. I use Goo Gone to remove the sticky residue off of the jar. 2. Mix up the boxed cake mix following the directions on the box, and separate the mix into smaller bowls, one bowl for each color that you would like to use. I used three different colors- green (with a tiny bit of yellow added) to make the Mike Wazowski cakes, and sky blue and purple to make the James P. Sullivan cakes. 3. Carefully drop the desired colors into the baby food jars, filling NO MORE than halfway up the jar. If you fill more than halfway, it’s just wasting it, because the cake will overflow and bake outside the jar and you’ll have to cut it off. 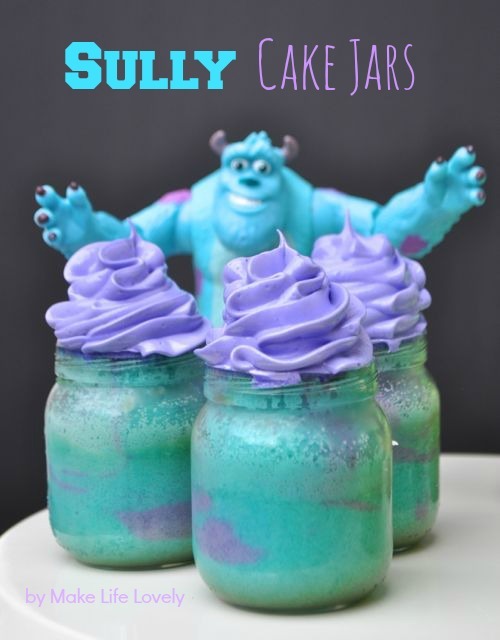 For the Sully cakes, start by adding some blue cake mix, then dropping small drops of purple mix in on the sides. I did a blue layer, then two drops of purple, then another blue layer, then two or three more drops of purple, etc. until the jar is filled about halfway up. 4. Place the jars in the oven at the temperature listed on the box, and bake for 10-15 minutes. Check the cakes after 10 minutes, and keep checking every minute or so after until the cakes are completely baked. If you leave the cakes for too long, they can turn a slight brownish around the bottom, so be sure to keep a close eye on them. 5. Remove cakes from the oven and let cool thoroughly before touching and frosting. 6. Make your preferred frosting recipe (or use store-bought). Split the frosting into two separate bowls. 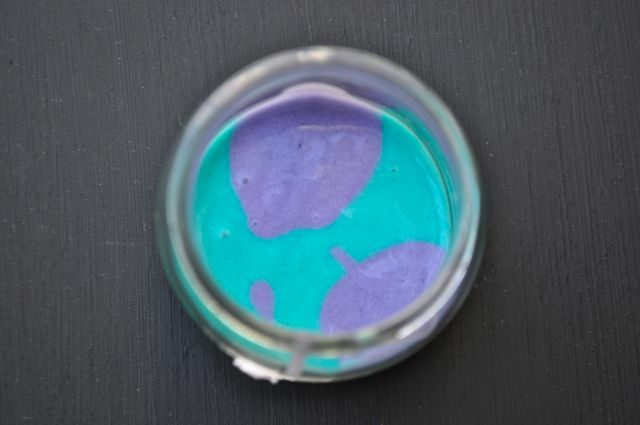 Add some green gel coloring to one bowl, and some purple gel coloring to the other bowl. 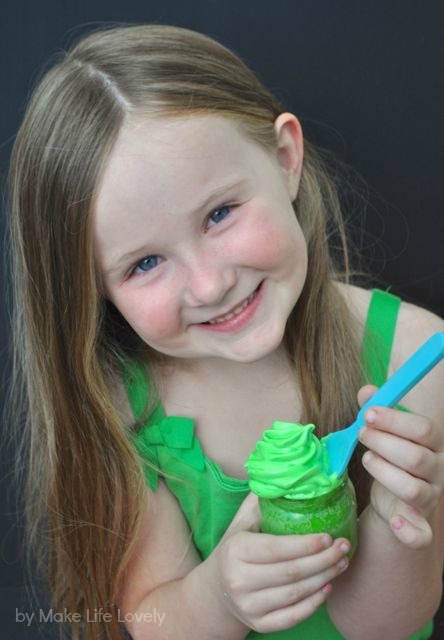 Pipe the green frosting onto the green Mike cakes, and the purple frosting onto the blue and purple Sully cakes. Aren’t they adorable? 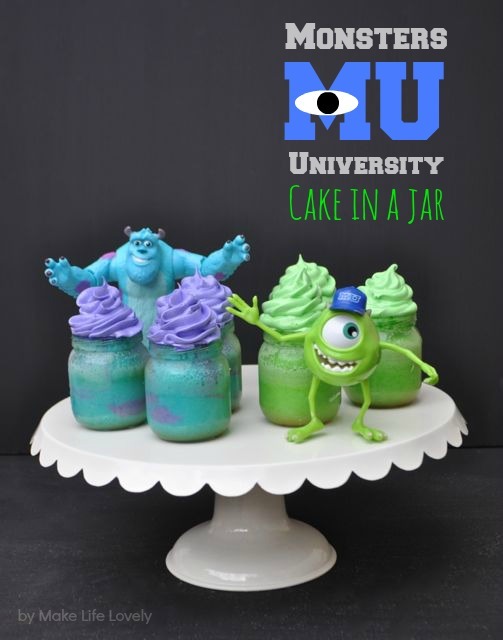 Your little scarers will LOVE their Monsters U cake in a jar! I just served these to the kids with a spoon, and they dug right in! Except for my little guy, who had to give his favorite furry monster a big hug before licking his frosting! 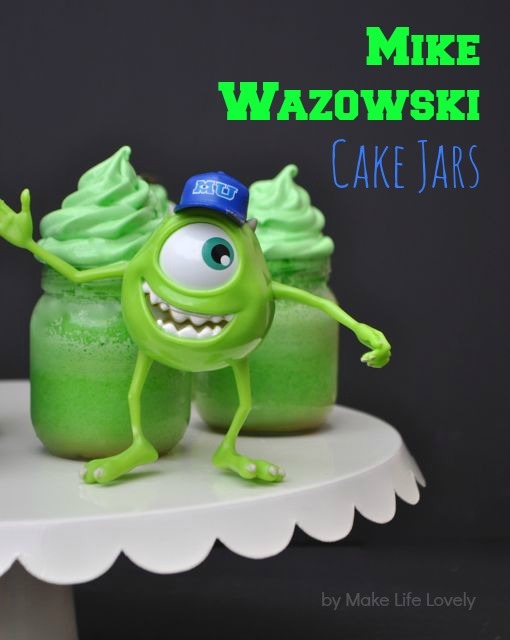 These are the perfect treats for your Monsters University movie night or MU party, and they’re great because they can be made a day or two ahead- just put the lids on the cakes, and wait to frost them until shortly before serving. We had a great family movie night watching this Disney’s Monsters University, and I won’t even tell you how many times they have watched the movie this week! It is a wonderful movie, and everyone in my family absolutely loves it! 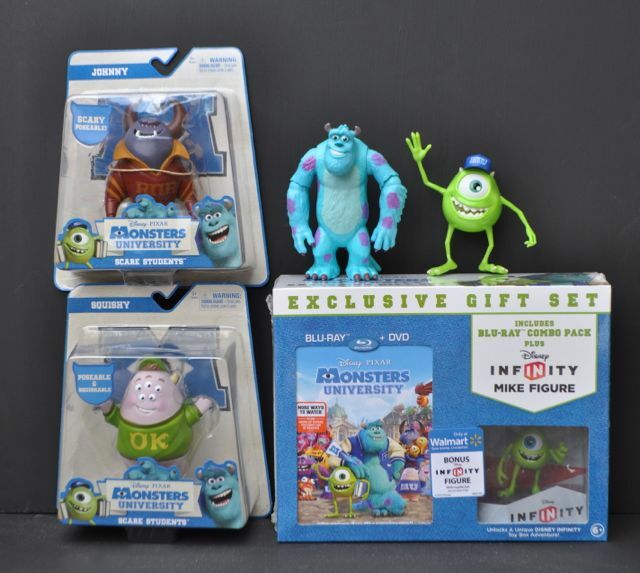 Be sure to get your copy of the special Monsters University 2-Disc Blu-ray + DVD + Infinity Figure Combo Pack at Walmart, and check out all of the cool Monsters U toys they have! 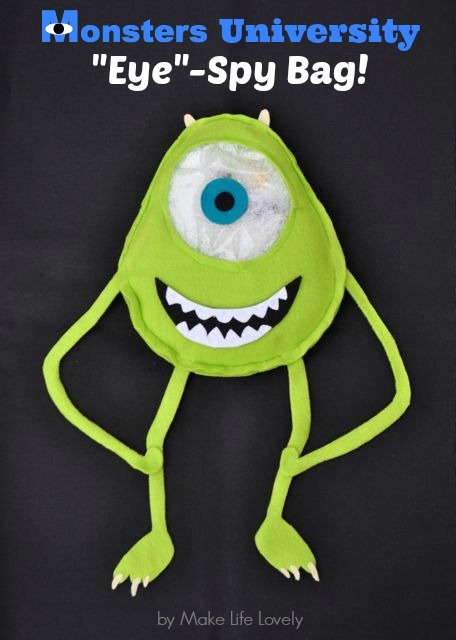 If you’d like to try making a fun MU toy for your kids, check out my Mike Wazowski EYE-Spy bag I made for my kids, using small Monsters U toys that I bought at Walmart a few months ago! I give complete instructions in the tutorial, so you can see how to make it here. These are so cute! My kids would love this and even I don’t think I could botch this up. Thanks! Yes, these are pretty tought to mess up, and so cute in the little jars! Thanks for your comment! Thanks so much Brandie. Plain old boxed cake looks amazing with some extra color and when baked in a jar! You could even get really creative and make some of the other fraternity colors, too. What temp did you bake these at?! So cute and fun! What size jars are you using? Appoximately how many jars will one box of mix make?? These are super cute… great idea! !